Weber, Bob. "William Dickenson Hunter". The Canadian Encyclopedia, 15 December 2013, Historica Canada. https://www.thecanadianencyclopedia.ca/en/article/william-dickenson-hunter. Accessed 25 April 2019. William Dickenson Hunter, "Bill," hockey coach, team owner and promoter (b at Saskatoon, 5 May 1920, d at Edmonton, 16 Dec. 2002). William Dickenson Hunter, "Bill," hockey coach, team owner and promoter (b at Saskatoon, 5 May 1920, d at Edmonton, 16 Dec. 2002). Hockey fans from Regina to Russia knew him as "Wild Bill," the man who founded the EDMONTON OILERS, took on the NHL with a rival league and nearly brought the pro game to his home town of Saskatoon. Hunter never liked the nickname, bestowed on him in 1949 by a Regina sportswriter after a particularly vociferous disagreement with a referee. Hunter was born in Saskatoon and completed his schooling at Notre Dame College in Wilcox, Sask. He considered school founder Pere Athol Murray as a major influence on his life. Hunter also managed the college's sports teams. One summer, he took the baseball squad on a 78-game tour of the Prairies, living off tournament winnings and eating bologna sandwiches by the side of the road. Hunter spent the Second World War in England where he flew Beauforts, Spitfires and Hurricanes for the RAF's International Squadron. By 1946, he was involved in hockey once again. For 25 years, Hunter owned, managed or coached minor-league teams in Saskatoon, Regina, Medicine Hat, Moose Jaw, Yorkton and Edmonton, sometimes wearing all three hats at once. In 1966, he was among a group of team owners who formed what is now the Western Hockey League. The WHL severed the bonds between junior and pro teams and has grown into one of the largest junior leagues in the world. Despite junior success - his Edmonton Oil Kings were 1966 Memorial Cup champs - Hunter wanted into the big leagues. Stymied in an effort to buy the Pittsburgh Penguins and denied an NHL expansion franchise, Hunter was interested when an old associate called him in July 1971 and told him about two American promoters interested in a new pro hockey league. Hunter, Gary Davidson and Dennis Murphy eventually started the World Hockey Association, a circus of musical owners and sometimes thrilling hockey that included a 1974 series with the Soviets. Although it remains a source of some of hockey's wildest lore, the league folded in 1979 and Hunter's team, the Alberta Oilers (later Edmonton Oilers), became one of four WHA teams accepted into the NHL and the only one still in existence. Yet, the league permanently changed pro hockey. It broke the NHL's reserve clause, which bound players to one team. It gave hockey its first million-dollar contract when Bobby Hull jumped to the Winnipeg Jets. And it brought hockey to new markets. Hunter sold the Oilers in 1976, but he made one more run at the NHL in 1983 when he heard the St Louis Blues were for sale. Hunter wanted to bring them to Saskatoon and eventually closed the sale, built the stadium and sold more tickets than he had seats. But the NHL, unconvinced such a small market was viable and unwilling to move a US franchise north, said no. His greatest hockey dream a failure, Hunter turned to curling and soon energized the game with big-money prizes and all-star lineups. 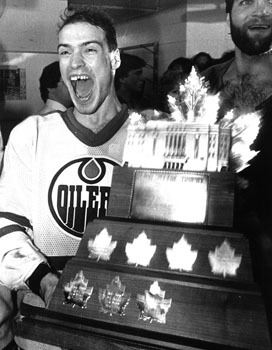 His last years were spent quietly in Edmonton and he passed away at the age of 82. 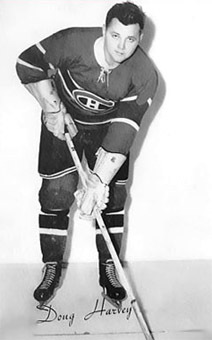 Hunter was a member of both the Order of Canada and the Canadian Sports Hall of Fame.